Thomas Gainsborough (christened May 14, 1727 – August 2, 1788) was one of the foremost portrait and landscape painters of eighteenth century Great Britain. He is recognized among the most innovative and enigmatic artists of his era. Some of his early work was influenced by Sir Anthony van Dyck and Peter Paul Rubens, but his landscapes, portraits, and so-called fancy pictures also show the work of an independent and original genius. Gainsborough is universally considered the most creative and adventurous artist in England between William Hogarth and J.M.W. Turner and poses a link between them. He also influenced the work of noted painter John Constable. His artistic life presents a continuous struggle to get away from the portraiture which earned him a living ("the drudgery of face-painting," as he called it) and to immerse himself in the genre of landscapes which was emerging then as a public favorite. 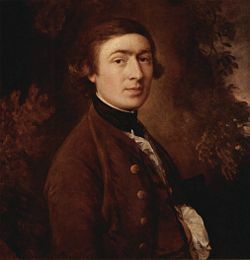 Gainsborough was born in Sudbury, Suffolk, England. His father was a weaver involved with the wool trade. Both Gainsborough and Constable grew up in the Stour Valley, running between Essex and Suffolk. Constable worked directly in the country all his life while Gainsborough took a different tack but never lost touch with the bucolic views of his youth. Constable was to remark in 1799, that, "It is the most delightful country for a painter, I fancy I see Gainsborough in every hedge and hollow tree." His family was fairly large and Gainsborough led an uneventful young life but always took pleasure in wandering through the countryside. His mother had a well-cultivated mind and excelled in flower painting and thus encouraged him when he showed an aptitude for drawing. At the age of 13 his father was impressed enough with his penciling skills to agree to send him to London to study art. In London he first trained under engraver Hubert Gravelot but eventually became associated with William Hogarth and his school. One of his mentors was Francis Hayman. In London he became associated with a collection of avant-garde painters centered around William Hogarth and the Academy at St. Martin's Lane. His skill seemed to come naturally and he was soon hired by art dealers to repair old paintings. This gave him a chance to study foreign artists, in particular the Dutch seventeenth century landscape painters, Jacob van Ruisdael and Jan Wynants. He would also have seen French and Italian works which would expose him not only to the realism of the Dutch, but to the Rococo curves. One of his mentors was Francis Hayman, who was famous for his scenes from Shakespeare and also painted scenery for the theater. Hogarth promoted the concept of public art and Thomas contributed to the decoration of what is now the Thomas Coram Foundation for Children and joined Hayman's team painting the supper boxes at Vauxhall Gardens. Gainsborough tried his hand at earning a living by selling drawings or small landscape paintings for small sums to the dealers and even sculpting figures of animals. On July 15, 1746, in Mayfair, London, Gainsborough married Margaret Burr, possibly an illegitimate daughter of the 3rd Duke of Beaufort, who had settled a £200 annuity on her and which greatly helped the young couple. This was a large sum for the time and since his work was not selling very well, it meant that the young artist was never forced to earn a living with his painting. Instead he was free to explore the countryside, making sketches for paintings and painting portraits of his children and friends. He would eventually create many beautiful pictures of his wife and daughters such as Self-Portrait with His Wife, Margaret (1746-1747), Portrait of the Artist with his Wife and Daughter, (About 1751-1752), The Painter's Daughters, Margaret and Mary, Chasing Butterfly, (about 1756), The Painter's Daughters, Margaret and Mary, Holding a Cat, (about 1759). He returned to Sudbury in 1748–1749 and concentrated on portrait paintings. 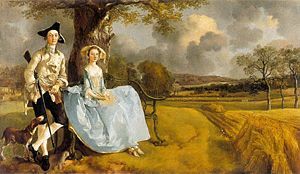 Gainsborough's Mr and Mrs Andrews (1748-1749), in the National Gallery in London, is the best known painting of his Suffolk period. Greatest among Gainsborough's early landscapes is Cornard Wood, often called Gainsborough's Forest. Probably begun in his Sudbury school days, aged 13, it was finished or repainted in 1748. Sudbury could not sustain him as an artist so in 1752, he and his family, now including two daughters, moved to Ipswich. This was a more cultured environment and commissions for personal portraits increased with his clientele becoming mainly local merchants and squires. His time in the country had served him well as his studies of nature and his landscapes, now influenced somewhat by foreign fashions, including the bucolic French contemporary artists such as Francois Boucher. His portraits of his young daughters are thought to be the some of his best yet he never put them up for sale. Even though the demand for his work was growing it was not enough to sustain them, so he had to borrow against his wife's annuity and made an exploratory trip to Bath in the autumn of 1758. During his time in Suffolk he had been studying a new French pastel technique used by portraitist Allan Ramsey (1713-1784) that produced a surface very different from the portraiture of Reynolds, who would become his rival. In 1759 he moved his family to Bath. The commissions came quickly and within a year he was well-known. The Poet Laureate, William Whitehead noted, "We have a painter here that takes the most exact likenesses I ever saw, his painting is coarse and slight, but has ease and spirit." 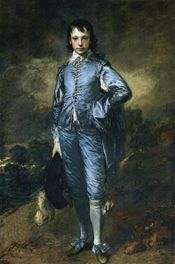 While establishing a reputation as first-class portraitist at Bath, Gainsborough painted his best known work, The Blue Boy the most popular picture in English art. The identity of the boy was long shrouded in mystery but is now believed to be Jonathan Buttal, teen-age son of a rich hardware dealer. The years in Bath saw his artistic maturation, but he continued to experiment in his imagery and techniques. There he concentrated his study on the portraits of Anthony van Dyck and was eventually able to attract a better-paying high society clientele. He was at the heart of the newly created luxury culture and Bath was second only to London. He was able to paint high society at its most fashionable and mix with his favorite musicians and theater artists. In 1761, he began to send work to the Society of Arts exhibition in London (now the Royal Society of Arts and from 1769 on he submitted works to the Royal Academy's annual exhibitions. He selected portraits of well-known or notorious clients in order to attract attention. These exhibitions helped him acquire a national reputation, and he was invited to become one of the founding members of the Royal Academy in 1769. His relationship with the Academy, however, was not an easy one and he stopped exhibiting his paintings there in 1773. In 1774, Gainsborough and his family moved to London to live in Schomberg House, Pall Mall. In 1777, he again began to exhibit his paintings at the Royal Academy, including portraits of contemporary celebrities, such as the Duke and Duchess of Cumberland. Exhibitions of his work continued for the next six years. 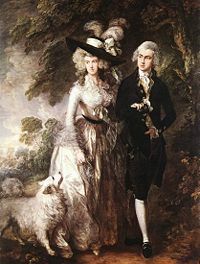 Mr and Mrs William Hallett (1785) exemplifies Gainsborough's mature style. In 1780, he painted the portraits of King George III and his queen and afterwards received many royal commissions. This gave him some influence with the Academy and allowed him to dictate the manner in which he wished his work to be exhibited. However, in 1783, he removed his paintings from the forthcoming exhibition and transferred them to Schomberg House. His subject pictures take on a special importance in his continuing effort to create a viable modern art. One of his park-scenes, The Mall (1783) represents his picturing of fashionable life taken to near visionary levels, evoking as it did the dreamy visions of courtly life of Jean-Antoine Watteau. In 1784, royal painter Allan Ramsay died and the King was obliged to give the job to Gainsborough's rival and Academy president, Joshua Reynolds, however Gainsborough remained the Royal family's favorite painter. He was later buried at St. Anne's Church, Kew, where the Royal Family regularly worshiped. In his later years, Gainsborough often painted relatively simple, ordinary landscapes with restless experimentation in defiance of academic distinctions. With Richard Wilson, he was one of the originators of the eighteenth-century British landscape school; though simultaneously, in conjunction with Joshua Reynolds, he was the dominant British portraitist of the second half of the eighteenth century. In the late 1770s he became interested in idealized rustic themes, notably of cottage life in the English countryside, where poor peasants carried on simple lives in humble cottages. His most famous painting of this genre is The Cottage Door (circa 1780), that depicts a mother and her children outside the door of their thatched hut, buried deep in a forest. Gainsborough did about five "Cottage Door" paintings, apparently so influentially that cottage life as a theme was taken up by a number of his contemporaries. Gainsborough's only known assistant was his nephew, Gainsborough Dupont. In the last year of his life he collaborated with John Hoppner in painting a full length portrait of Charlotte, Countess Talbot. Gainsborough died of cancer on August 2, 1788 in his 62nd year. Gainsborough painted more from his observations of nature (and human nature) than from any application of formal academic rules. The poetic sensibility of his paintings caused Constable to say, "On looking at them, we find tears in our eyes and know not what brings them." Gainsborough himself said, "I'm sick of portraits, and wish very much to take my viol-da-gam and walk off to some sweet village, where I can paint landskips and enjoy the fag end of life in quietness and ease." His most famous works, such as Portrait of Mrs. Graham; Mary and Margaret: The Painter's Daughters; William Hallett and His Wife Elizabeth, nee Stephen, known as The Morning Walk; and Cottage Girl with Dog and Pitcher, display the unique individuality of his subjects. Gainesborough is well represented in the national galleries of London, Ireland, and Scotland; in the Wallace Collection, London; and in many private collections. 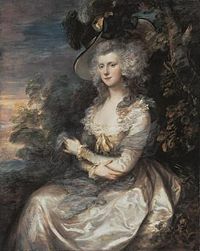 Examples of Gainsborough's work may be seen in the Metropolitan Museum of Art in New York City and the museums of Cincinnati, Boston, Philadelphia, and St. Louis. His famous The Blue Boy is on display at the Huntington Art Gallery in San Marino, California. Gainsborough's House on Gainsborough Street in Sudbury is now a museum open to the public. Gainsborough's House boasts one of the most important collections of his paintings outside of London and also contains furniture from that period, a modern art gallery, and gift shop. Thomas Gainsborough’s A wooded landscape with a herdsman, cows and sheep near a pool (circa 1786), considered one of the most beautiful Gainsborough landscapes, was auctioned in 2008 for $5.75 million, breaking the previous record for one of the greatest English landscape artists by almost $2 million - and in the process became the most expensive British eighteenth century landscape ever sold at auction. ↑ Charles Robert Leslie, Memoirs of the life of John Constable (London: Phaidon Press, 1951), 8. ↑ Thomas Gainsborough Biography Biographybase.com. Retrieved October 19, 2008. ↑ Grace Glueck, 'Blue Boy' for a Living; Landscapes for Pleasure New York Times, 2005. Retrieved October 19, 2008. ↑ Robert Hughes, Laureate of the Ruling Classes TIME Magazine, 1980. Retrieved October 19, 2008. ↑ Gainsborough's House gainsborough.org. Retrieved October 27, 2008. ↑ World Auction Records Tumble Antiques-collectibles-auction-news.com, April 15, 2008. Retrieved October 19, 2008. Leslie, Charles Robert. Memoirs of the life of John Constable. composed chiefly of his letters. London: Phaidon Press, 1951. All links retrieved August 12, 2013. Webmuseum Paris: Thomas Gainsborough. Ibiblio.org. Blythe, Ronald. 1988. A Gainsborough Landscape Query.nytimes.com. Boulton, William Biggs. 1907. Thomas Gaisborough Books.google.com. This page was last modified on 13 August 2013, at 18:46.